As a trusted distributor of Rolls-Royce Power Systems MTU brand engines and generators, Pacific Power Group’s partnership with Rolls-Royce Power Systems has flourished over the years. This November, PPG’s marine team has expanded its partnership with the Rolls-Royce group with the signing of a new agreement that makes Pacific Power Group a distributor and service provider of Rolls-Royce steel and aluminum series water jets in the Western U.S., Alaska and Hawaii. With this new agreement, Pacific Power Group is now a single-source provider of the complete range of Rolls-Royce marine propulsion components including engines, control systems and waterjets. 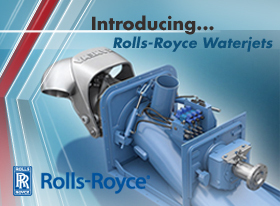 “Pacific Power Group is an existing distributor of Rolls-Royce MTU engines, which (is) the perfect complement to our range of water jets,” said Tommi Viiperi, the general manager of waterjets sales and marketing for Rolls-Royce said. Pacific Power Group’s reputation for customer care combined with expertise in propulsion system engineering and service was a defining factor in winning this distributorship and PPG’s advanced marine expertise will continue to be a critical to Rolls-Royce customers across the Western U.S.
Want to read more about PPG’s expanded partnership? Click here to read more in Marine Link.